Le Monnier Mansion in the French Quarter. It took me a while to connect with New Orleans because of all the tourists, but after a week here, I’m absolutely fascinated by the city. Sure, the eerie atmosphere of the gas-lighted streets at night, the voodoo history, and the ghost and vampire legends at times scared the bejesus out of me, but it’s all part of the experience. You couldn’t pay me to stay in one of the old hotels in the French Quarter. They are haunted. I’m super sensitive to ghost vibes, although I would think their presence would be obvious to anyone stepping into this neighbourhood. It’s a major tourist draw. The stories fascinate me, but I’m not waking up in the middle of the night to that stuff. Nope, not me. You think I’m kidding? I’m absolutely not. New Orleans is one of the most haunted cities in America. The dead can’t stay buried here because the water table is very high. Early settlers saw coffins floating down the street during rainstorms. That’s why now they have these beautiful above-ground tombs in their cemeteries. So where can you stay that’s not haunted? If you want to be in the French Quarter, your best bet is one of the newer hotels. Because I was here for a volunteer event for the Kabbalah Centre, our group stayed in the Hyatt Centric French Quarter near Bourbon Street. It’s modern and comfortable, in the middle of the action, and even has an outdoor pool. If you’re looking for a more eco-friendly option, Ecocult’s post informed me that there are not really eco hotels in NOLA. Since I stayed two extra days after my event to explore the city some more, I switched hotels to a locally-owned one Alden recommended, so money can circulate back to the city. International House is only two blocks from the French District. It’s upscale and trendy—the lobby looks like a chic nightclub—plus I’m told there have been no ghost sightings. Perfect. Airbnb is another option. I can’t guarantee it’ll be ghost free, but if you go for a space that’s not too big, with cheerful, modern decor, it should be okay. Maybe buy some sage to cleanse the space? The apartment belonged to a friend of my friend, but she was staying there alone the first night. Parisian style, it’s spacious and beautiful with high ceilings, antique furniture, and chandeliers. She gave me a tour, and I was biting my lips not to say anything because the space was so obviously haunted, although the energy wasn’t heavy and smothering. I didn’t feel the spirits were necessarily evil or even that interested in making contact. They were just there. My friend was already a little spooked, but I think my reactions did not reassure her. She had her pick of bedrooms, but she chose to sleep in a small entertainment room with windows, which had space enough for a cozy couch and a big screen TV. I would’ve done the same. It’s true that the infamous Bourbon Street can get rowdy. Like the Red Light District in Amsterdam, this is the kind of area that draws tourists and repels locals. I’m not saying to stay away because there are some fun places here, but watch out for craziness—fights, drunk people, and all that, especially on weekend evenings. Fritzel’s European Jazz Bar on Bourbon Street is worth visiting for outstanding jazz. Locals also like The Jazz Playhouse. Next time, I’d like to visit the historic Preservation Hall (just off Bourbon on St. Peter Street). To have fun somewhere that’s not Bourbon Street, go to Frenchmen Street. More locals come here, and you’ll find almost any genre of live music to choose from. If you don’t know where to go, just start on one end of the street and stop in when you hear something you like. We had fun at Three Muses, listening to chill blues and jazz, and drinking strong cocktails. If you want to do something a little different, go to Rock ‘n’ Bowl, which offers the winning combination of live music and bowling. You’d have to Uber there and the food is terrible (think overcooked pizza), so eat beforehand, but it’s a fun place to listen and dance to Zydeco music. Maybe bowl a little if you can get a lane. I didn’t know how to dance, but since men lead, a sweet expert on the dance floor helped me learn. I thought Nashville was America’s Music City, but New Orleans seems to be a close second. While Nashville draws musicians struggling to get their big breaks, music is a way of life here. Live bands are staples at weddings and funerals. If you walk around Frenchmen Street or the French Quarter, especially on Royal Street, you’ll come across street musicians, just like in the movies. As for good cocktail bars, check out Loa, in the lobby of International House. I was so intrigued by the art deco Sazerac Bar in the The Roosevelt Hotel. You know I love my fancy hotel bars, and this is one of the more sophisticated ones I’ve been to. Of course, there is also the famous Carousel Bar that slowly spins inside Hotel Monteleone. William Faulkner, Truman Capote, and Tennessee Williams used to frequent. New Orleans is one of the top food cities in America and often named the best in the South. The thing to try here are beignets, deep-fried dough with powdered sugar. The place to get them is the famous Cafe du Monde. Because the lineup for the cafe can be long, I recommend getting your beignets to go in the separate takeout line and eating them in Jackson Square. If you can get a table, enjoy your beignets with coffee. Cafe Beignet is also good. Their Royal Street location is cute, and it’s not so busy that you can usually get a seat. Cafe du Monde has the best beignets, in my opinion, because the ones from Cafe Beignet were a bit crunchier. Maybe it was just my batch. I’ll have to retest when I go back. For Breakfast or lunch (“brunch” is banned from my vocabulary – blech), I recommend the Rubby Slipper Cafe, Willa Jean, and Cafe Fleur-de-Lis (I loved their oyster po-boy sandwich). I had to try gumbo, a Louisiana staple. Locals voted Gumbo Shop as the best, so I ordered their chicken gumbo. To my disappointment, it was too salty for me to enjoy. For popular restaurants, be sure to make reservations, especially when the space is small and seating is limited. The timing wasn’t right for me to try K-Paul’s Louisiana Kitchen, but I did get to try Sylvain‘s hip take on Southern food. Lisa, one of my Uber drivers, gave me a tip sheet of her favourite restaurants and activities in New Orleans. Some of her favourite restaurants include Antoine’s, Boucherie, Bourbon House, Broussard’s, Cochon, Emeril’s, Dooky Chase, Liuzza’s, Madina’s, Praline connection, Willie Mae’s Scotch House, Guy’s Po-Boys, and Le Croissant d’Or… You won’t run out of good restaurants to try in this city no matter how long you stay. The best meal I had was at Cane & Table. I ordered the Arroz Verde with Roasted Cauliflower. Meat and seafood are big in Southern cooking, so to say my favourite meal in New Orleans is a vegetarian dish is saying a lot. The interior design of this restaurant is gorgeous, in a Havana-influenced style that seems to be popular in NOLA: distressed walls and lots of wood, topped with chandeliers. Somehow I ended up at someone’s meticulously decorated house on my third night in NOLA. The couple who owns it regularly hosts dance parties. A live band played in a corner of the living room while dancers twirled away. I didn’t get to meet the hosts because the party was packed, but I was told one of them is an interior decorator. It really shows throughout the house. My friend describes the decor as “barnyard burlesque.” I think it’s the city’s own take on “upscale hipster.” Again, it’s in this Havana-influenced style, but New Orlean’s take on it has a darker vibe, using muted colours, more antiques, and creepy artwork. That old wedding photo hanging above the bed is an example. Yes, creepy is cool here. When we went to The Frenchmen Art Market, many paintings and photographs include elements of death. I think it’s all in good fun, and people seem to be happy playing up their dark side. There are even tribes of vampires here. “Creepy” supports the vibe of the city. It’s a place where people can belong if they’re a bit kooky. If you’ve just moved to New Orleans, instead of joining a vampire coven, taking up swing dance is a good way of making friends. There’s a real community. And you’ll get invited to dance parties like this one. A photo of us in the creepy style typical of NOLA. 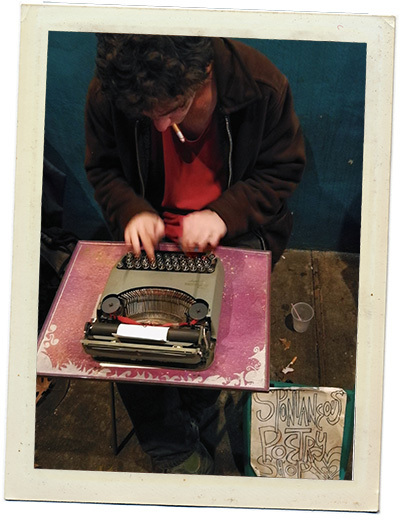 On Frenchmen Street, you’ll find young poets who can type up poetry for you on the spot. You pay whatever you think the poem is worth. I met Calvin, whose influences are ee cummings, Rilke and Baudelaire. I thought he and his friends could be characters from a Southern novel. He asked me for a topic. I said, “freedom.” I had been pondering a lot about freedom that week and what true freedom meant to me. Cigarette dangling from his lips, Calvin started typing like a madman. In less than two minutes, he pulled out the little piece of paper and gave it to me. I read it in awe. His poem really channeled the answer for me. Everyone I showed it to after wanted a copy of it. The poem is framed and sitting on my desk; I’m looking at it as I write this. It still moves me. It’s genius. New Orleans has a rich literary history. Truman Capote and Hemingway to John Grisham and Anne Rice all found inspiration here. If you go inside Hotel Monteleone, immediately to the left, you’ll find a glass display of books written there. The hotel has been used as a setting in over 173 stories. The writer most associated with New Orleans is Tennessee Williams. He was the one who said, “America has only three cities: New York, San Francisco, and New Orleans. Everywhere else is Cleveland.” From his apartment on St. Peter Street, he could hear the rattle of the streetcar named “Desire.” Yes, his 1947 play was named after a real streetcar line, No. 952. In 1948, the Desire line lost its streetcars, and currently buses run this route. 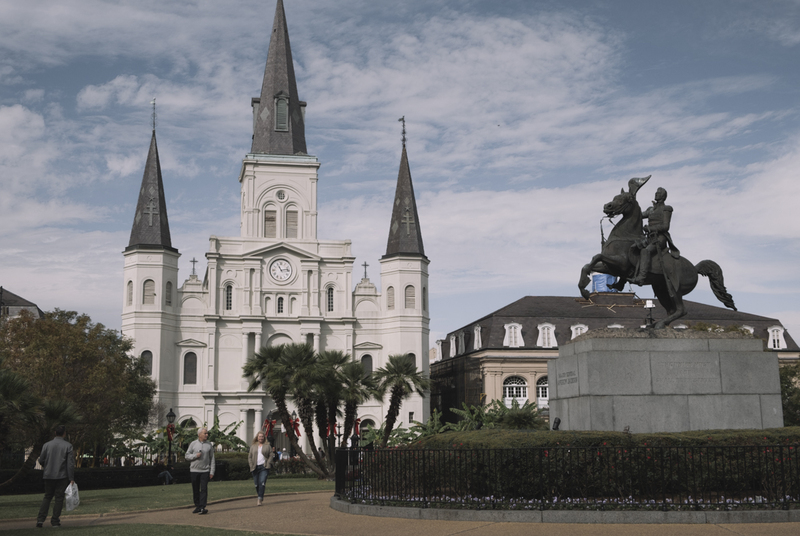 The French Quarter historic district is great for first-time visitors because it’s very walkable. The French and Spanish influenced architecture and busy tourist scene lend the area a sunny charm during the day. By night, the quiet streets lit with gas lamps can take you back a few centuries. I highly recommend the walking tours. I took the French Quarter tour and learned so much about the history of the city and the melange of people from different backgrounds. I heard stories about pirates, ghosts, and Marie Leveau, the Voodoo priestess. And that Bourbon Street is not named after the alcohol, but French royalty, House of Bourbon. I also visited the Pharmacy Museum. It didn’t sound very enticing, but I heard good things, and I’m glad I went. It’s a step back in time. This museum used to be America’s first licensed pharmacy. The history of the tools and medicine is just grisly. The place is haunted, naturally. And it’s a real location in a vampire legend (more on that later). I saw all kinds of psychics and such around Jackson Square and didn’t trust them. But when I stumbled upon the Bottom of the Cup Tea Room, which has been around since 1929, a tea leaf reading sounded innocent enough. I had a ten-minute session with Otis, a no-nonsense type who has been doing readings there since the ’70s. He certainly got my personality and affirmed some things I already knew, and he made some predictions. After, he gave me a CD recording of the session. Future readings can come true, especially if you believe in them and make them come true, but the future is constantly changing depending on the decisions you make. I generally avoid psychic readings because I want to make my own destiny and not get stuck on one outcome, but I wouldn’t mind if his predictions came true at all. After my reading, I was given a cup of tea to go, in a biodegradable cup. Starbucks take note. This place is awesome. I didn’t do a lot of shopping here because the cultural experiences are so much more exciting. I did visit the UAL (discounted designer), Krewe (the super cool local sunglasses brand), and a couple of vintage shops, but only bought nontoxic perfume at Hove. I heard Magazine Street has more retail shops and it’s supposed to be hip and contemporary. A note on local style: I noticed that some people, especially women, like to dress up in non-era specific vintage when they go out. It seems to be a mixture of ’20s flapper, ’40s swing dance, and Victorian. I like the effort they put into it, and it’s so normalized. If I dressed like this in Toronto, I’d probably get some looks. I had planned to do a ghost or voodoo walking tour, but when I got to the city, I changed my mind. I wanted to be able to sleep at night. I only learned a little about voodoo on this trip. I’d like to do a voodoo walking tour next time, and learn more about Marie Laveau, the Voodoo Queen of New Orleans. There are plenty of voodoo shops here, some more novelty than others, but I didn’t want to mess with that stuff unless I learn more. What I did do was visit the Boutique du Vampyre, the only shop in America dedicated to vampire needs. You can buy “blood” to drink, an Emergency Vampire Stake Kit, and there is even a “fangsmith” to make you custom fangs. When you buy something, you get an invite to Potions, their vampire-themed speakeasy. I checked it out one night, and it’s kind of cute, nothing crazy. I bought a book by Marita Woywod Crandle, the owner of the store. New Orleans Vampires is about the history of vampires in New Orleans, which includes three major vampire legends: The Casket Girls, The Count St. Germain, and The Carter Brothers. As I read the book during my trip, I was able to visit the real locations mentioned in the legends. The Pharmacy Museum is where the Carter brothers supposedly struck a deal with the pharmacists to get their fix of human blood, squeezed from leeches. Bloodletting used to be popular back in the day to cure and prevent illness, and using leeches was one way of doing it. I also passed by the Ursuline Convent, now a museum, which was rumoured to host the mysterious Casket Girls. A map in the book shows where the Carter brothers and St. Germain supposedly lived. I did stumble upon St. Germain’s apartment building and looked up at the balcony where a woman, a victim of Germain’s, had supposedly escaped to and jumped to her death over a century ago. The Ursuline Convent…where the Casket Girls used to live? Anyway, these are just legends passed down throughout the generations, so who knows what’s true. They are fascinating, and they did make me consider the possibility of vampires. The story that really freaked me out was in the afterword, where the author recounted a real-life experience with a mysterious stranger with a cane. Good thing I was already back in Toronto when I read that chapter because I would’ve been thoroughly freaked out walking around New Orleans with this information. Read the book for yourself and let me know what you think about the legends. New Orleans just turned 300 years old, and the NY Times named the city the #1 place to visit in 2018. This has definitely been one of my more memorable trips. I’d return and check out other areas, such as the Garden District and Magazine Street. A friend told me that Savannah has a similar vibe in that it’s also beautiful, historic, and haunted, which is why I really want to go there soon. And Charleston. I’m charmed by the South. What’s your favourite thing to do in New Orleans? Let me know in the comments below.